Everyone who engages in heated paintball games knows the wrath of paintball bruises and welts all too well. It’s part of being a serious paintballer. If you haven’t played in a match yet you may not know what paintball bruises and welts feel like. To make a long story short, it does not feel good. However, you should not overly worry because there are ways to avoid getting paintball welts and bruises. By the end of this guide, you will have a deep understanding of paintball welts and bruises. You will also learn how to play a safer game of paintball. 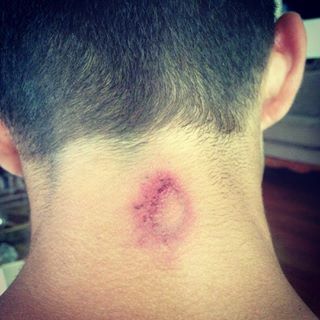 Below, you will learn the definitions of both paintball related injuries. Paintball welts vary in size and cause the skin to raise. Normally, the raised area will turn reddish or purplish if more severe. Paintball welts are painful to touch, but usually heal faster than paintball bruises. The main difference between a welt and a bruise, is the bruise will remain under the skin instead of raised. Normally bruises will turn purplish or even black. It takes time for the color to fade as the bruise heals. How do paintball bruises and welts occur? What should you expect? The two main factors that determine the severity of a bruise and welt are power and distance. The more powerful the gun, the worse the bruise or welt. Then you must factor in the distance from which the shot was fired. The closer the shot, the worse the bruise or welt. Additionally, different parts of the body are more sensitive to bruising. If you get hit in the stomach, it will hurt more than getting hit on a strong muscle in your back. The last factor is paintball protective gear. Most of your body should have protection during a serious paintball match. This will significantly lower the chances of bruising or forming a welt. If you do get hit hard enough to cause a bruise or welt, expect to feel some degree of pain. The degree of pain depends on the severity of the blow and area of the body. If you are an experienced paintballer, you already know what it feels like. If you are new to the game, do your best to protect yourself by using protective equipment. If the pain is severe and doesn’t subside, you should always see a doctor to get yourself examined. If you are a tough guy, the next section outlines different methods you can use to treat paintball bruises and welts at home. The sooner you begin treatment, the better chance you have of cutting down recovery time. The first thing you need to do is apply a cold compress to the bruise site. If you don’t have any ice packs at home, simply put some ice in a Ziploc bag. The key thing to remember is using a buffer. You don’t want to apply the ice bag directly to the skin. This can cause more harm than good. The magic numbers are 15 minutes on and 1 hour off. Repeat the process during waking hours to ease the pain and reduce the size of the bruise. Next up is warm compresses. Day 1 is strictly cold compresses. After day 1, you can begin treating the bruise site with warm compresses. An easy way to create a warm compress is by dipping a towel in warm water and then ringing it out before applying it to the paintball bruise site. The same magic numbers apply to warm compresses – 15 minutes on and 1 hour off. The warm compresses help paintball bruises heal by improving circulation. In result, you will experience less discoloration in the skin. One cream every paintballer should have in the cabinet is vitamin K cream. It can easily be purchased over the counter from your local drugstore. If you can’t find it there, order some online to have on hand. Vitamin K cream works wonders on paintball bruises. Make sure to follow the directions on the packaging after picking some up. An age old trick for relieving all types of aches and pains in the body is an Epsom salt bath. It’s even easier to find a bag of Epsom salt than vitamin K cream. Local drugstores and grocery stores both carry it. Once you have some, fill up your bathtub with warm water the way you like it and add the recommended amount of Epsom salt. Give the salt a little time to dissolve and swirl it around in the water to make sure it is evenly dispersed. The optimal soaking time is a minimum of 30 minutes – the longer the better. Your body will feel relaxed and rejuvenated after an Epsom salt bath. Sometimes treatments that may seem unconventional at first end up being the best of the bunch. Also, these natural treatments will cost you next to nothing. Some people swear by rubbing the skins of potatoes or bananas on paintball bruises to reduce pain and speed up the healing process. Both potatoes and bananas contain high levels of potassium. You should begin treating paintball welts with a cold compress the same way you would treat a bruise. The main goal is to reduce swelling from the beginning as much as possible. Haven’t you always wondered what that stuff is in the first aid section next to the peroxide and alcohol? It has a cool name, but you never get to use it. Well, now is your chance! Witch hazel is a great treatment option for paintball welts to reduce pain and swelling. The more you rest, the quicker your skin will heal. This is the perfect excuse to sit on the couch all day and marathon watch your favorite TV show. If possible, elevate the area of your body with the welt. This is best to do if the welt is on one of your limbs. After elevating the welt, the swelling should immediately reduce. How Long Does it Take Paintball Bruises and Welts to Heal? Now that you know all about how to treat paintball welts and bruises, you may be wondering how long it will take them to heal. The answer is not definitive, but they should never last more than a week or two. In general, paintball welts will heal much faster than paintball bruises. A minor welt can clear up in a matter of hours, while a bruise can sometimes take over a week to heal if it’s severe. Another thing to take under consideration is the fact that everyone is different. Some people bruise easily and will take longer to heal. If you are someone who bruises easily, you should take extra precautions to protect yourself before engaging in battle. In this final section, you will learn several different tactics you can use to avoid paintball welts and bruises all together. By implementing these preventative methods, you shouldn’t have to suffer from any serious pain. The best way to avoid getting hit in the first place is by learning the game before electing to join a match. Do you think the US Army releases soldiers into war without a ton of training first? No! You should prepare yourself the same way for your first paintball match. Talk to some more experienced players to learn some tips. Do a ton of research before buying a gun. It will pay off in the long run. The last thing you want to do is join a paintball match wearing nothing but a white t-shirt and mesh shorts. If you make this mistake, you are just asking to get lit up with paintball bruises and welts. Instead, put on some thicker layers. Long Johns are a paintballer’s friend. Protective gear should be the first thing on your shopping list. Get acquainted with the different types of gear available and which parts of the body they protect. You need to understand why you need each piece of equipment and how it will protect your body. Helmet is the first item on the list for a reason. Your head and eyes are the most important parts of your body to protect. From there, work your way down the list until your entire body is protected. You can read our reviews for the best paintball mask, the best tactical pants and the best tactical gloves – right here on PBGuy! Not everyone has the bankroll to load up on expensive paintball gear all in one shot. Start with the most important pieces of equipment first – helmets, paintball masks, tactical pants, tactical gloves and thigh pads. The game is a lot more fun when you’re not worrying about getting hurt. Paintball leagues create rules for a reason. The league leaders should have a lot of experience and know how to keep players safe. Every terrain is different. The league leaders will have the most knowledge of the terrain. Make sure to follow the rules and play the safest game possible. You are not only keeping yourself out of the danger, but all the other people in the league out of danger when you follow the rules. If someone isn’t following the rules, you need to speak up and tell someone. If you are playing a casual game with your friends, it’s still important to set up some guidelines before starting a game. Everyone should always be on the same page. You are now the master of paintball bruises and welts. If you apply all the valuable information you learned today to your gameplay, you may never have to deal with a nasty bruise or welt again. In the event you do suffer from a bruise or welt, you know all the different ways you can treat them. If you were frightened about starting to play because of paintball welts and bruises, now you know what to expect. Always remember, if you think you need a doctor, get yourself checked out just in case. Now get out there and start playing! And if you’re still looking for the right paintball gun check out our detailed review of the best paintball guns on the market.